and peacefulness. These are actually the same characteristics that make it so easy for dogs to create strong bonds between them and their keepers. 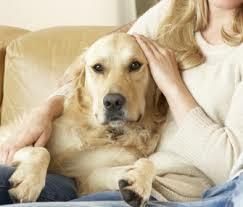 Dogs are observed to bring out a lot of positive feelings and reactions from people. Because of this, a lot of recent studies had been conducted regarding their effectiveness in being instruments for relieving stress, anxiety, and depression. One study stated that having dogs can actually lessen peoples stress and anxiety through improving peoples moods, improving their social support, encouraging them to exercise, and elimination their feeling of loneliness. Another study showed that men with AIDS had a lesser tendency to experience depression by keeping dogs as pets. Also, dogs had been noted to provide a sense of companionship to people and are even said to improve a person's self-esteem. They prevent people from experiencing and thinking about negative feelings and ideas, thus, lessening the possibility of those people to feel stressed, anxious, and depressed. Among the most stressful and, possibly, depressing professions that are, considering the pressure imposed upon them by other people, are probably those of Hollywood stars. Aside from the load of work that they have to handle, they also have to watch our for possible reasons that people can find and use to criticise them. Hollywood actors and actresses are actually forced to do certain things such as to constantly show happiness, to always dress well, or to lose more weight, especially when they need to appear in public, even if that is not how they really feel or what they are really like. This must be the reason why a lot of Hollywood stars keep dogs as pets. They probably need these canines to relieve them from all the stress, anxiety, and depression that comes with celebrity fame and fortune. Famous actors and actresses such as Will Smith and Courtney Cox have been noted to say that their dogs help them to become more happy aside from the companionship and sense of security that these canines provide. Another article about celebrities and their dogs reported that people in Hollywood choose to have pet dogs because 'they need the unconditional love and support man's best friend provides'.